Irritable bowel information, what's going on down there? Irritable bowel syndrome (IBS) is a functional gastrointestinal (GI) disorder. Symptoms are produced by changes in how the GI tract works. Such patients experience frequent symptoms with no resultant damage to the GI tract. • IBS with constipation (IBS-C): It is associated with passing of hard or lumpy stools at least 25 % of the time and loose or watery stools less than 25 % of the time. • IBS with diarrhoea (IBS-D): Watery stools are present more than 25% of the time and hard stools are present less than 25% of the time. • Mixed IBS (IBS-M): hard stools are present at least 25% of the time, while loose stools are also present at least 25% of the time. • Unsubtyped IBS (IBS-U): hard stools more than 25% of the time and loose, watery stools more than 25% of the time. As one can see, IBS can be associated with both constipation and diarrhoea. The exact cause of irritable bowel syndrome (IBS) is not known. However, it is widely accepted that IBS is related to an increased sensitivity of the gut. Here are some of the suspected causes of IBS. The normal GI tract motility, (the normal time it takes stool to pass through the GI tract) is disturbed in patients of IBS. Slow motility can lead to constipation and fast motility can lead to diarrhea. Patients with IBS are more sensitive to pain caused by the stretching of bowels by gas or stool, as compared with people who do not have IBS. Psychological problems like panic disorder, anxiety, depression are common in people with IBS. However, it is still unclear why these disorders lead to the development of IBS. Studies indicate that people who have been abused tend to express psychological stress through physical symptoms. Some people who have bacterial gastroenteritis may develop IBS. 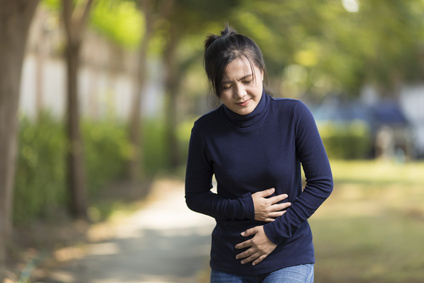 Small intestinal bacterial overgrowth refers to an increase in the number or a change in the type of bacteria residing in the small intestine. These bacteria can produce extra gas & can also cause diarrhea. Studies showing antibiotics to be effective in treating IBS support this hypothesis. However, the weight of scientific research does not support the effectiveness of antibiotics in treating IBS. Patients suffering with IBS have imbalanced levels of neurotransmitters and GI hormones. But the role of these chemicals in IBS is unclear. Studies show that IBS is more frequent in people with relatives who have a history of GI problems. Many IBS patients have reported an increase in their symptoms when they eat foods rich in carbohydrates, fatty foods, and alcohol. However, studies indicate that these symptoms may result from poor absorption of sugars/bile acids which are important for breakdown fats and for waste elimination. There are roughly an equal number of patients affected by each of the subtypes of IBS. There is also evidence showing that over time most IBS patients alternate between episodes of diarrhea and constipation. Therefore it is difficult to find a single drug treatment that will relieve all symptoms of IBS. Hence the correct Identification of the type of IBS is important to start treatment. • Diet: For IBS with constipation, increasing the amount of soluble fibre in diet and water intake helps. • Stress management: Reducing the amount of stress can help lower the frequency and severity of IBS symptoms. • Medications: antispasmodic medicines, laxatives, anti-motility medicines, antidepressants. Some gastrointestinal diseases (like IBS and ulcerative colitis) have been associated with magnesium deficiency. Magnesium plays an important role in the treatment of IBS. • It helps to relax the intestinal muscles which helps maintain smooth bowel rhythms. • It attracts water into the colon, leading to increased amount of water in the stool. This helps soften the stool to make it easier to pass. Taking a daily magnesium supplement may provide long-term help in relieving IBS. IBS can have both symptoms of constipation and diarrhea. Due to the magnesium deficiency associated with cases of IBS, magnesium is especially important for patients with IBS. Note: As with any over-the-counter remedy, talk with your doctor before starting on a magnesium supplement.